2BA Tufflex Black Dart Tips™ S.S.
None of the 1000 I bought will stick in the stand-up electronic boards unless I hurl them like a baseball once to compress the tip. And that is hard on the board so I can't use them. Very disappointing. I love the way you order and in few days its at the door. Good price and shipping was quick. Good price for the tips. Seem a little soft. I get about two-3 games before I'm replacing one or two at a time. Pretty typical actually so I rate it as average. 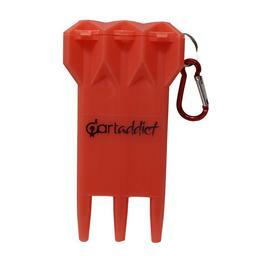 Great product, a must for any level of darter. Sorry guys, normally all of your products are rated a 4 or 5 with me, but I am not happy with this one. Recently I purchased a batch of 1000 tips. I don't know if it is a different plastic or what but they are all very soft and bend too easily compared to the last batch I purchased. Our entire team uses these tips and we are having to resort to using these as practice tips until we can find some that are harder to replace them. 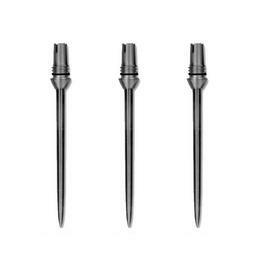 We're new to soft tip darts however these tips seem quite durable. They are short and stick good. Pretty stiff tips, don't bend or break. Love these tips!! No more replacing BENT tips every other game. We have used these tips for a long time and they seem to be the most durable. Like the shorter tips! My husband and I love to dart. We really like the shorter tips but had a difficult time finding them until I looked you up on the web. Thank you so much, they are great!! so far these tips have worked just fine with no problems so far. These tips are more durable than long tips. Instead of breaking they only bend (most of the time) giving you longer play time between changing tips. I use 20 gram darts and always have a problem breaking tips but I put these on and already I see a big difference durability wise. I ordered a bag with 1000 so im good to go. Your tips are great, quality and the price was right. I have purchased from Muellers, in the past there quality is great but they charge to much, I was happy to hear about your website because your prices seem to be fair, your quality is just as good if not better. Wife likes them, will switch next game night. Great delivery time. A tips a tip...lol..for the most part. However, I will say they seem fairly durable, and the price is awesome for the amount you get. Thanks! Those tips are shorter than others I have used, but that is to their advantage; they do not flex as much and thus won't weaken as easily. I replaced all the tips on all 6 sets of my darts with these. I believe this will reduce the number of occurrences where I will need to actually replace the tips (because of breakage or extreme bending). They can handle 18-gram darts, they shall last much longer on lighter ones. Best tips i've used yet. Bought for my boyfriend and he's VERY happy with them! Great service. Will continue to place orders!! Bought these for my boyfriend and he is extremely happy with them. Excellent tip, thrown with 18g Suregrip dart, last the whole night of darts. 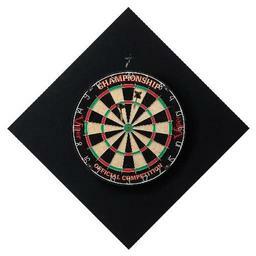 dont work in home dart boards very well. I got them because I throw 18 grams. On my board at home they bend, then bounce out, but don't break. At a bar, on a newer board, they work better, but still bounce out more than my old ones. Love the prices and have been looing all ver the place to get new dart tips for a while. Best price I have found yet. I would reccomend these tips to any player that throws an 18 gram dart and also throws it hard. My friend who throws softer gets a lot of bounce outs, but for me they are perfect. 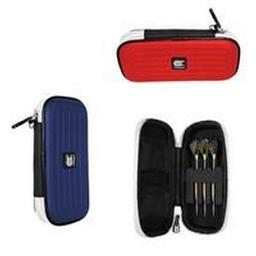 Very durable, look good with blue darts. Good stiffness but twice the number of bounce outs in my board, however seemed to work nicely in my buddy's board. I did not realize it would differ from board to board but it sure seemed to for me. I Love these tips !!! They are the BEST !! These tips worked out great. They are strong and durable. I havent had the need to change them, after a few hours of play! Highly recommended! Love these tips lenght is good and they are very tuff been thru about 150 tips so far and have yet to break one or even bend one so bad that i could'nt play with it i use 18g tungstens and these tips are awesome. Best tips I've used yet! Think it's a great tip! I prefer the shorter style and its durability is impressive. I bought them mainly for the durability and I am pleased. Great tips very durable. Highly recommend. Good tips, fast ship, couldn't ask for anything more. Great tip! I prefer the shorter style and its durability is impressive. I bought them for the durability and I am pleased. This is my second purchase for these tips. Highly Recommend. Great tough durable tips. Last a long time. Highly Recommend. Dart tips are very durable. I like them. GREAT PRODUCT, FAST SHIPPING, WILL BUY FROM THEM AGAIN. High quality, a great price, and fast delivery. Short tips are a must have if you want to be a good dart shooter and these are the best I have found. They don't break and very reasonably priced! They're durable, but not indestructable. I still manage to break them, but not as often as a lot of other brands. On my 18 gram freaks they hold up very well...but they bounce out way too much for my liking(1-2 darts a set). These tips seem a lot stronger....we like them. What can I say that hasn't been said. The only tip I use...bought the bag of 1000. I throw a hard dart and they hardly break. LOVE these tips not having to change every 10-15 games been on the same ones now for upwards of 100 games. simply the best dart tip I have ever purchased. have sacks full of the long and longer tips, might as well throw them in the garbage or donate to the local pub. These 2BA Tufflex Dart Tips are the best. Being an amature, but an old man also. We tend to not know our own strength. So these bad boys stick every time, No bending, because they stick in the dartboard, only bending I have found is when I hit the wall behind the dart board. Period. 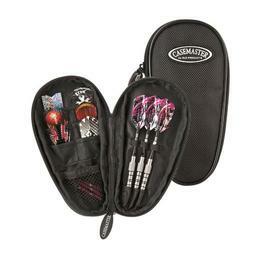 Get a lot of bounce out using them with 16 gram darts. Very good tips do not break easily. They last a long time and do not brake easily. took me three orders to finally figure out that these are the bad boys that fit into my darts. The diameter of the screw-in-part is less than your standard bar dart (which I think are also 2BA??) Anyway, they are very stiff tips and they work great! Perfect length. I love the short tips. Great tips . Duribility rated among the best that I've used. Great short tips. They stick in the board better than the longer ones which tend to bend and break. Great tips, great value. Being shorter tips, I go through less of them since they don't bend as easy. Durable tip. Good price. Quick shipping. THESE TIPS ARE GREAT. CUSTOMER SERVICE WAS EXCELLENT. Great price for a box of tips. I like the style of these for tough and seem to last a long time. these tips rock!! they last longer than any other tips i have used. Used these before, they last a long time and when buying in bulk make a great deal. Awesome tip. Holds up nice and prevents that wobbling with heavier darts!! I am happy that I finally found tips that are a bargain. They are very durable. They are great tips. 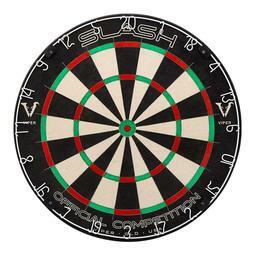 I tell everyone on my team to check this site out when they need dart items. great customer service, too. These tips have outlasted every other type I have used. They may bend but I haven't broken a one yet. I do recommend the Tufflex dart tips to anyone. Awesome tips and Awesome price!!!! Excellent tips. Won't use anything but. They work great for the price and are about as short as they can be to still stick! Length is great but have broken a dozen in the short time I used them went back to my old 2ba white tips. Better than the longer tips. They do pop out of the board and do break though. I would consider buying these shorties again. Great tip. Doesn't bend easily....doesn't break easily. Bounce outs are a thing of the past! Very durable tip. Holds up great with 18 gram darts. These are good quality tips that hold up fine. I haven't broken any yet. Agree with everyone elses reviews, they are better than the long ones cause they don't bend easily and will last much much longer. I love these soft tip shorties because they are short and very strong. Last a long time and do not flex as much as the longer ones. These are the best short tips that money can buy. They may bend after a night of darts, but I rarely have any break on me. These tips work really well with the Tungsten Bee darts! Excellent tips! The favorite tip of everyone in our dart league. These withstand a lot of pressure. My son uses them and he throws very hard and they hold up to him. A little too short for me. Great deal! Service and product just what I expected. Finally found the "stubbies" that I like. They don't break as easily and they don't bend after being thrown a couple of times. GREAT service...same day shipment. A few go a long way because they hold up so good. Very durable. I haven't managed to break one yet. Super tip. Very durable. Like the shorter tip and seem to throw better darts with it. I use an 18 gm dart and these withstand a lot of punishment. My wife and I utilize many boards in many places and these seem to match up anywhere we go. I think it's a great tip! I prefer the shorter style and its durability is impressive. I bought them mainly for the durability and I am pleased. I use them on 18 gram darts and the hold up great.